Ola! Back from the deepest depths of my inventory conundrum! I have not blogged in a bit due to some unforeseen inventory sorting lol. But its high time I kicked myself into gear, just in time for the newest rounds of The Liaison Collaborative, Collabor88 & of course Uber. I have to admit even though I have tried to let go some of my perfectly wonderful and fabulous items…….there is always room for more yes?! I absolutely love the Sia Fairy Tales Skin from Glam Affair, I have not taken her off since nabbing her at C88, and there are so many pretty make-ups to be had! Uber has this down right gorgeous Sapphire Style from Little Bones, this is going in my vintage folder for sure. Foxes is a newer store to me but the Faux Fur Stoles are simply fabulous……..I need every color hehe, oh and do not pass up the pretty rings from Ariskea…….all at Uber. Now onto my most favorite event, The Liaison Collaborative……..every single store in this event is one of my ultimate favs. Izzie’s has the beautiful Romance Pearl Set available in many different colors, you get a necklace in three styles, left and right flowers and of course a version without. You get the amazing earrings, and bracelets as well as two version of crowns(not shown) but I’m sure to wear these very soon. Kunst has a collection of Vintage Cigarette Holders that come with a hud to change colors and even how the smoke comes out….love these! Junbug has a wonderful Mesh Mademoiselle Coco Gown out in many beautiful shades, I absolutely love everything made by Junbug. Black Tulip has some wonderful poses out, The Dress, there are also a few couple pose sets as well to be had. What Next has made this wonderful Isabelle Clock Shelves, not only can you set your time in each zone but you can also change the texture of the clock face as well as the books already added, then cram on top all your wonderful items to fill this up. 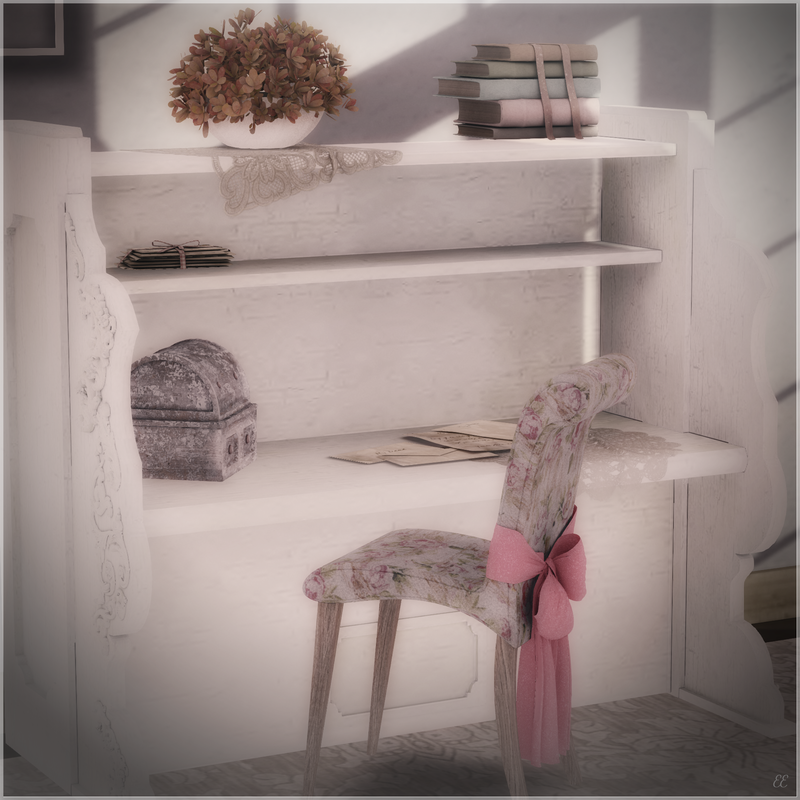 Kalopsia has this very fantastic Arabella’s Desk/Chair/Drapes Set out, the chair includes 10 poses and the desk has room for all your favorite collectables along with the few that are included.